There is an air of finality in Germany. A sense that, as the year begins to draw to its close, so too does the era of Angela Merkel. 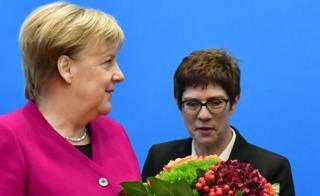 She will step down on Friday as leader of her CDU party and has confirmed that she won’t stand again as chancellor when her fourth term ends in 2021. There’s a famous German saying: "Everything has an end — only sausages have two." It comes to mind now, as the smell of frying meat drifts from Berlin’s Christmas markets and mingles with the spicy aroma of mulled wine. Wandering through one market, a couple of pensioners disagree about her legacy. "I must say I’m sorry to see her leave," says Ingrid. "It was bad luck for her with the refugee policy, but for me she was the chancellor." "She’s been in the job too long," Heinz argues. It would be better to have a two-term limit like they do in the US." Can Merkel complete her term? The race to replace Mrs Merkel as CDU leader is particularly charged. The person who’s chosen to lead the party could emerge as the next German chancellor. "Unlike the UK, the party leader does not automatically become the prime minister candidate too, but traditionally it’s always been good for a chancellor to be chairperson of his or her party," says Jan Techau of the German Marshall fund. He says that Mrs Merkel’s decision to step down as CDU leader but stay on as chancellor creates friction in the system. "The moment you announce your resignation as party chairperson, everyone’s waiting for the moment when you also resign as chancellor." And so, as Germans rush about preparing for Christmas, three candidates have feverishly toured the country, holding hustings for the party faithful. It all comes to a head at the party conference on Friday, when just 1,001 delegates will have the chance to vote. At a hustings in Berlin, the rank and file crowd in to meet and question the three people who, whilst relatively unknown outside Germany, have become household names here. The 56-year-old former prime minister of the state of Saarland was appointed general secretary of the CDU earlier this year and is the party favourite, polls suggest. Popular in Saarland and Berlin, she has an unpretentious style and a reputation for calm analysis as well as political acumen. Her greatest strength is also her greatest weakness; she’s a Merkel loyalist who’s perceived as someone who will replicate much of the chancellor’s style and policy. The millionaire businessman was a powerful player in the CDU in the early 2000s but left politics when he fell out with the chancellor. Since then the 63-year-old lawyer — who has strong links to America — has built a career in the private sector and works for US company Blackrock. He appeals to the more conservative and business-minded wing of the party and has the official backing of ex-finance minister Wolfgang Schäuble. Mrs Merkel’s health minister is ambitious and, aged 38, the youngest of the three candidates. The former banker was once described by Mr Schäuble as "one of the great hopes for the future of our party". But Mr Spahn has ruffled feathers in the party and in the cabinet. Sharply conservative, Catholic and gay, he is a divisive figure for many. After nearly 20 years as party leader, Mrs Merkel still commands extraordinary respect within the CDU. The candidates have to somehow embody change whilst also representing continuity. Watching in the audience, CDU supporter Michael says he would like AKK to take over: "We are looking for someone who can keep the party together, who will encourage lively debate but who can also achieve results. And someone who will — in the medium term — be able to replace Mrs Merkel as chancellor." Another supporter, Elke, worries that Angela Merkel is leaving a big gap. "We might need all three of them to fill that gap," she says. What no-one is addressing openly here is the question which produces acres of speculative newspaper columns. Those who would write Mrs Merkel’s political obituary are often premature. She says she intends to stay as chancellor and work alongside the new party chairperson until 2021. Much depends on who that person is. But few now think that’s likely — including Jan Techau. "The moment the new chairperson is in the conservative party, her power base will erode even further, the authority will diminish and, depending on who it is, that person will seek the stand-off and will seek the decision rather sooner than later. So, sitting it out is unlikely." In a country where leaderships last and change tends to be slow, the political season is beginning to turn.